Keeping hair healthy and beautiful is simple using herbs and a few common household ingredients. I often employ the baking soda/vinegar method for cleansing my hair. Though I do sometimes use a bit of castille liquid soap, and when I'm feeling ambitious brew up a soapwort shampoo. The key is using mild soaps or other cleansers and not detergents which are what most commercial shampoos are made of. Coconut oil makes a great conditioner. Massage just a little coconut oil into the hair before shampooing. I start at the ends and work my way up. Massage it in, leave on for a while and then wash out. I like to put it on before I go outside and let the warmth of the sun give me my own "hot oil treatment". Again, just a little bit will work well…too much and you may have an oily mess. If my hair is a bit wild and fly-away, I smooth it out by rubbing just a drop or two of coconut or almond oil between my palms and then run them lightly through my hair. Honey also makes a good hair conditioner. Wet hair and massage about 1/2 cup (less for short hair) of honey into the scalp and hair. Cover with a plastic shower cap and then wrap in a warm towel. Leave on 30 minutes or so, then rinse and shampoo as usual. It is a bit sticky at first, but rinses away easily. One caution, do not go outside with this on unless you want to attract the attention of bees! Nettle and Horsetail herb are both said to be good for your hair. A nice cup of horsetail tea anyone? Sage and Rosemary are said to darken the hair, and are good for the scalp. 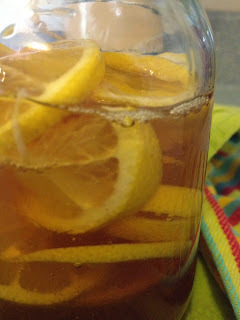 Make an infusion, cool and use as a final rinse. Simple. Calendula and Chamomile are said to highlight blonde hair. Again, a simple cup of tea will work, just be sure to let it cool before rinsing! Honey and lemon juice are also used to add highlights or lighten the hair, and spending some time in the sunshine with one of these natural lighteners in your hair may speed up the process. Hibiscus and Cinnamon are often used to add red highlights, as well. Probably the best known natural hair color is Henna. It can be a bit messy, but it not only colors the hair (and skin and anything else it touches, including but not limited to, my favorite shower curtain) but it also conditions the hair unlike chemical hair dyes. It comes in several colors, so you can mix your own personal hair color if you are adventurous. Rosemary Gladstar’s Family Herbal has good detailed information on using henna, as well as many other hair care recipes and great herbal information. Dried herbs such as horsetail, nettle, calendula, sage, rosemary and excellent quality oils can be purchased from Mountain Rose Herbs. Do you have a tip for healthy hair naturally? I'd love to hear from you!